Many of the uniquely well-integrated and well-used urban gardens we’ve explored this year sit on public land: Spring Ridge Common, Canada’s oldest public food forest; the Compost Education Centre demonstration site; and the Vic High learning farm, cultivated in partnership with Mason Street Farm, are all located on local School Division property. 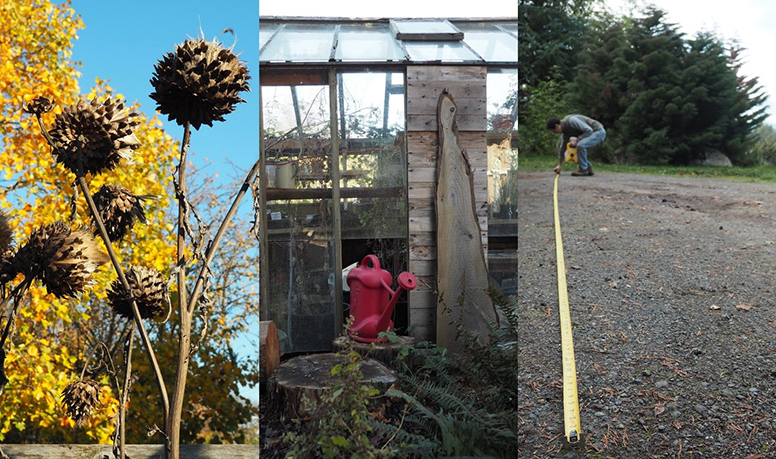 Sometimes the arrangements are less formal: we talked about guerilla gardening and other subversive approaches to building urban resiliency with Mark Lakeman and Oliver Kelhammer earlier in the year. A city’s density can offer both a gift and a curse – proximity to people and businesses can supply rich human and material resource flows for a permaculture garden to tap into. On the other hand, these same forces can operate in lockstep with NIMBYism, layers of bureaucracy, and development pressure. A well-loved guerilla garden around the corner from my place, Baby Arlo’s Garden, ran afoul of authorities and was slated to be ripped out and replaced with grass before the neighbourhood outcry halted the plan, if only temporarily. 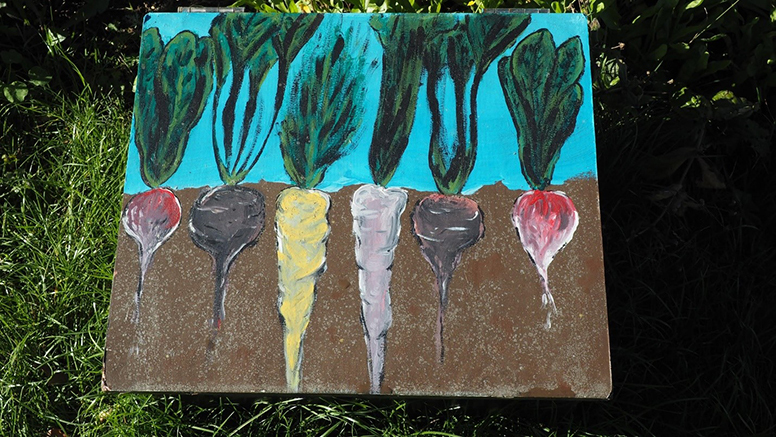 Art on an irrigation panel at the University of Victoria Campus Community Garden. But sometimes a combination of clever advocacy, good will, and persistence can lead to more lasting solutions. One day recently we joined Stephanie – one of our Natural Building instructors earlier this year – at a triangular parcel of land wedged in between a windy football field and a firehall. An alder chip pathway led through a chain-link gate and then into a rambling warren of beds and outbuildings. A sign on the gate, written first in SENĆOŦEN, told us that we had arrived at the UVic Campus Community Garden. Stephanie greeted us at a central gazebo that was flanked by rain barrels, with rain chains snaking down to feed them from the eavestroughs above. Bales of hay were stacked against the side, and so I leaned on one and struck what I pictured to be a figure of elegant autumnal repose. The garden moved its current site here in 2011. But its path to existence prior to that had been fraught: students unhappy with what they perceived as university inaction towards approving community garden space on campus planted raised beds in front of the university library in a protest action in 2010. Police arrived and tried to break up the demonstration with threat of arrest, but were thwarted when supporters ringed the students who were gardening. (L): Spiky heads of the Cynara cardunculus (commonly called globe artichoke, or cardoon), gone to seed in the gardens at Hatchet & Seed. The cardoon is often grown as an ornamental for its striking looks, but permaculture growers appreciate them as important bee forage and a source of mulch; their edible stalks are also a popular delicacy in some parts of the world. (C): The greenhouse at Hatchet & Seed. Note the open ventilation window on top and “blowout panel” on the side – proper ventilation and air circulation in a greenhouse serves to regulate temperature, limit pest pressure, encourage visits from pollinators and other beneficial insects, and helps the plants perform photosynthesis efficiently. It’s often assumed that greenhouses should be oriented due south for maximum sun exposure, but a slight eastern orientation is often preferable as it maximises morning light and limits the hotter late-day sun. (R): Tayler measuring off a 10 meter length for students to practice and measure their pacing distance at Tiny Tree Farm. The relationship has improved considerably in the years since: after its move to the current site, the number of plots has increased to ninety, including individual allotments for faculty and student use, accessible raised beds, communal “giving gardens” for community volunteers and for food bank donations, and teaching plots reserved for use in classes. Beds at the garden are supposed to measure 3 x 4 meters, but my eye noted a few that spilled over in deviously inadvertent-looking ways to gain valuable extra square footage. Stephanie, who works as the garden coordinator here, explained that the site is funded by a student ancillary fee ($1.50 for full-time students and $0.75 for part-timers). But universities are a bit like miniature cities in their own right, and the garden has also been successful in tapping into the various resource flows that surround it. Coffee grounds and juice pulp from campus cafeteria vendors are used to make enough compost that the garden is practically self-sufficient. Other materials, like chopped leaves and chipped trees supplied by groundskeepers and campus facilities staff, are used for mulch and garden pathways. 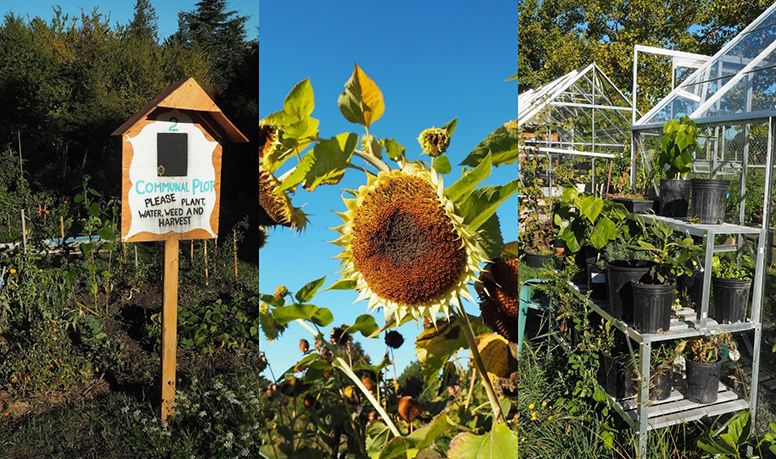 (L-R): Communal plots at the University of Victoria Campus Community Garden; late-season sunflowers starting to lean; volunteers snake through the slats of a plant rack beside the greenhouse. And in return, the garden gives back. Free workshop series run through the spring and fall semesters, teaching basic horticulture and permaculture principles as well as canning and preserving, wildcrafting, and holistic nutrition. As we walked around the site, Stephanie pointed out hops vines which were being grown for the campus brewing club. In a reflection of its many and varied tenants, the garden felt pleasantly meandering and also a bit eccentric. Some of the allotment plots were exactingly maintained, while others were scruffier, boasting wild tufts of vegetation and unexpected companion plantings. In a soupy back corner was a wild-looking permaculture patch initiated by local Victoria legend Geoff Johnson (who was also the driving force behind Spring Ridge Commons). (L): Ribes aureum, clove currant, growing at a Hatchet & Seed client’s property in North Saanich. The clove currant is a native deciduous shrub, whose blooms bring the scent of clove in early spring. A popular permaculture plant, it is drought-tolerant and thornless, and its fruit can be used to make an excellent wine. (C): A 300 gallon rainwater tank used for irrigation at the University of Victoria Campus Community Garden. (R): Leycesteria Formosa, Himalayan honeysuckle, showing evidence of the leafcutter bee. A thriving goumi bush had grown enormous and threatened to dominate its neighbours without a winter pruning, but I also saw mulberry, blackcurrant, valerian, salmonberry, lovage, and a variegated black elder growing tall and serene. There was a lot of food back here. A sunken hügelkultur planted with blackberries was flanked by a jostaberry, some fennel, and a spiky, deer-resistant gooseberry bush. Along the fence was a patch of rhubarb and some fuki (Petasites japonicus), an introduced perennial native to Japan whose young shoots are edible. As we headed north towards the main entrance I picked out some other permaculture favorites growing here and there: salad burnett, skirrett, oka, and delicious Chilean guava (Myrtus ugni). Nearer the gazebo was a toolshed and wash station, with greywater from the sink diverted to feed neighbouring figs and raspberries. Because municipal water on site is shut off over the winter months to prevent pipe freeze, a rainwater harvesting system was installed over the summer for the greenhouse roofs. Plans for the future here include an on-site plant nursery, construction of some cob structures, and a composting toilet. And in keeping with the guerilla roots of the place, a few walnuts and autumn olives peeked at us cheekily from outside the gate, refusing to be constrained by the garden fence. It felt at once indispensable and ever-evolving, both shaping and responsive to the community around it – not bad for a little garden born of a protest. 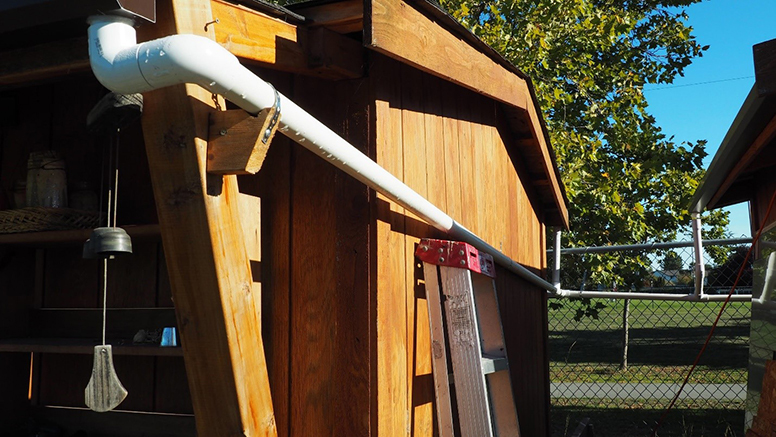 Rainwater capturing PVC pipe running from the roof of the tool shed at the University of Victoria Campus Community Garden. 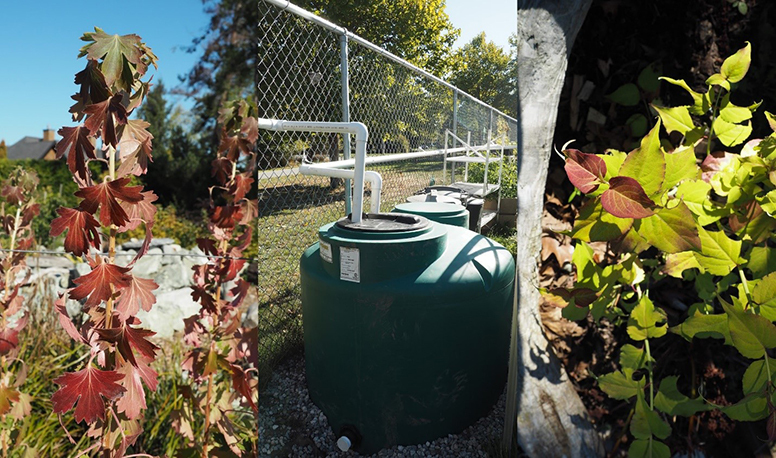 Harvested rainwater is stored in a tank and used to irrigate the common plots on the site.